Canadian Prime Minister Stephen Harper has denied reports that his office intervened in the processing of Syrian refugee claims. But the Conservative Party leader has admitted he ordered a security "audit" of those being resettled. The allegations were first reported by the Globe and Mail newspaper on Thursday. 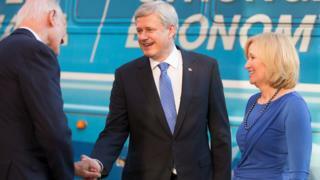 They have refocused attention on Mr Harper's response to the Syrian refugee crisis ahead of 19 October elections. The Globe and Mail reported that the prime minister's office earlier this year ordered a halt to the processing of one class of Syrian refugee claims and asked immigration officials to hand over refugee files for vetting. It said the halt meant UN-approved Syrian refugees had their resettlement in Canada delayed. Mr Harper admitted Thursday that he had asked for a security "audit" of the refugee resettlement process but denied that his political staff had been directly involved in vetting applications. "Political staff are never involved in approving refugee applications. Such decisions are made by officials in the department of citizenship and immigration," he said. The Syrian refugee crisis and Canadian immigration policy - simmering issues for much of the Canadian general election campaign - have now become front-page news. Revelations that Mr Harper's government intervened to slow down the asylum review process - to ensure Canadian national security, his supporters claim - will undoubtedly be used as a political cudgel by his opponents. NDP leader Tom Mulcair already has accused Mr Harper of callous indifference to migrant tragedy and linked the story to the death of three-year-old Alan Kurdi, whose family reportedly sought Canadian residency before he was found dead on a Turkish beach. Mr Harper built his governing majority, in part, on the strength of his appeal to recent Canadian immigrants. But if these new stories lead Canadians to believe that Mr Harper is playing politics with the asylum system - by giving preference to applicants who were potential supporters or from particular religious backgrounds - his image as a unifying leader of a diverse nation could be jeopardised. At the very least, these revelations have put the prime minister on the defensive during the critical final week of a campaign that has his party fighting to hold onto power in the face of a strong challenge from Mr Mulcair's NDP and Justin Trudeau's Liberal Party. Transport Minister Lisa Raitt told the CTV Television Network that the audit had partially aimed to make sure Canada was taking in vulnerable ethnic and religious minorities. CTV, citing immigration department sources, has reported that Mr Harper's office sought to give priority to religious minorities including Christians over Sunni and Shia Muslims. Opponents of the ruling Conservative Party have seized on the reports. Liberal leader Justin Trudeau said the government had been "irresponsible", while New Democrats' leader Thomas Mulcair said the revelations were "a shame on Canada". Mr Harper's government has faced criticism for not doing enough to help migrants and refugees fleeing conflict in the Middle East. His government has pledged to take 10,000 refugees by September next year by speeding up processing. The Liberals have called for 25,000 refugees to be taken in by the end of the year, while the New Democrats have pledged a target of 46,000 over four years. A Liberal tipping point in Canada?